CHICAGO (CNS) — The Sharifs were living contentedly in Pakistan when life turned into a nightmare in 2012. An al Qaida-related group called BLA targeted Amir Sharif, a Catholic and a well-known professor at a university in Quetta. He was told to embrace Islam or leave the country. Amir, 45, and his wife, Saira, 30, a high school math teacher, and their two sons, Unss, 9, and Runaan, 10, were under threat. Persecution of and discrimination against Christians in Pakistan is a common occurrence, Amir said. They, like others, lived in fear of being accused of violating the part of the country’s penal code that criminalizes blasphemy against Islam, the state-recognized religion. Within a week they fled, leaving everything behind — their home, belongings, bank accounts. Later, the extremist group seized all of that. For two days they hid out. Then they took a cab to Karachi for a flight to Sri Lanka. They knew a priest there and hoped he would help them find a place to stay. When they reached the priest by phone, he told them not to come, that he didn’t have a place for them. The family boarded the plane anyway and spent the flight praying that God would find a way. 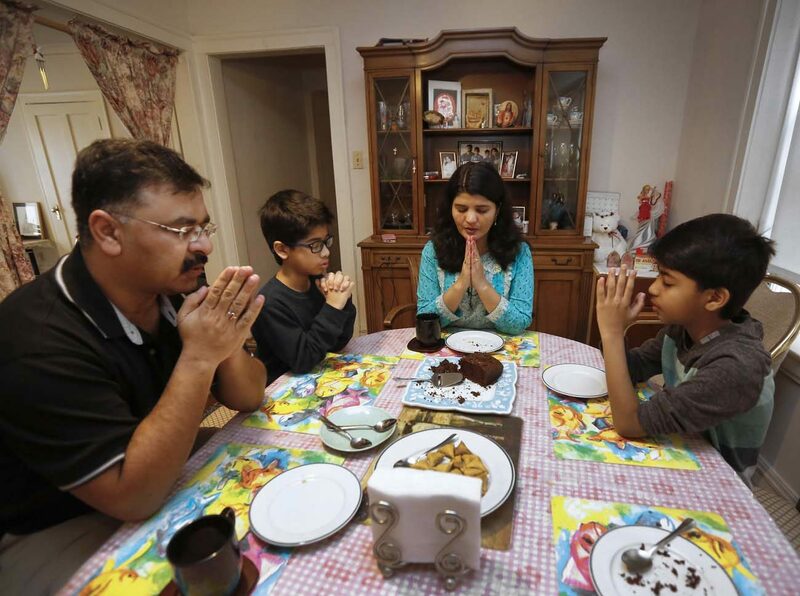 Their entire journey from Pakistan to Chicago has been paved with answered prayers, both Amir and Saira said. When they arrived, the priest, an Oblate of Mary Immaculate, was at the airport and took them to stay at the seminary where he lived. They stayed there for 40 days until the priest said they had to leave. Fortunately for the family, the Oblates’ provincial visited the seminary and told them not to worry, that he would arrange for them to stay somewhere. Throughout the Sharifs’ stay in Sri Lanka, the congregation provided the family with food and housing. They moved the family to another Oblate property and gave them a large room with a kitchenette and four beds in which to live. The Sharifs were grateful for the help, but it was not easy living. The room had a tin roof and was sweltering in the tropical climate. “It was like an oven,” Amir said. When it rained, which happened often in the tropical country, the noise was loud. But that wasn’t all. “The issue was the snakes,” he said. The children couldn’t often play outside because there were numerous snakes in the grass, many of which were poisonous. They killed 18 snakes, including three cobras, during their time there. They also had to kill scorpions inside their home. The children couldn’t attend school because public schools weren’t taught in English and private schools were too expensive. Saira tutored them in mathematics and English. There are no refugee camps in Sri Lanka, so anyone seeking asylum must support themselves and figure their way around the system. “We were unable to work over there. If you are an asylum seeker you are not allowed to work,” Amir said. Eventually they learned they needed to visit the U.N. High Commissioner for Refugees office. There was paperwork to complete and many interviews with various agencies. The family arrived in United States in May 2015 and were set up in a studio in Rogers Park. On their second night in Chicago, Saira and the boys were sick, but Amir went out walking and asked directions to the nearest Catholic church in the neighborhood. He was directed to St. Ignatius, where Mass happened to be going on. The family was embraced by the parish and the boys are now altar servers. Later, the family was given a one-bedroom apartment. All four of them sleep together in the same room. They’ve met some volunteers who have helped them with things such as furniture and other household items. Amir has three master’s degrees and Saira has two, but finding employment comparable to what they had in Pakistan has been difficult. They arrived in May and Amir found a job on his own in September with the Heartland Alliance working with unaccompanied immigrant children. “In those three, four months, we were just running around. All of the time I was running to the library spending the whole day there trying to find a job,” he said. Saira just started working as a substitute teacher at Sacred Heart Schools in Chicago. One son attends Northside Catholic Academy. There wasn’t space for the second son, so he attends the public school. It hasn’t been easy since coming to Chicago, but God has been there every step of the way, Amir and Saira said. Duriga is editor of the Chicago Catholic, newspaper of the Archdiocese of Chicago.